Barbary, as published in the Mercator Atlas Minor 1734 edition. 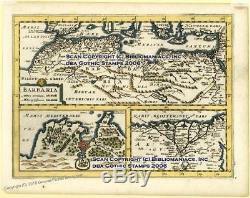 Nice three-maps-in-one showing the Barbary Coast / North Africa to Egypt. With a more detailed map of the Tunis / Carthage region, and the Nile Delta. Lightly colored in a fine hand, strong impression, and very good condition save some minor edge tanning and marginal soiling. Measures ca28.5x22 cm including small (3-5mm) at top to adequate margins for matting. Mounted lightly with mounting tape upper two margin corners on a temporary mat. Blank verso with chain-line watermarks. Absolutely guaranteed an original antique map. Reference Koeman Atlantes Neerlandici, indexed under Me 207. See Our About Me Page for more information. All items are absolutely guaranteed genuine as described. We are members of the American Philatelic Society (APS), the American Stamp Dealers Association (ASDA), and the German Philatelic Society (GPS), are a Colorado corporation (dba Gothic Stamps, Inc) and have been dealing in philatelic and numismatic items since 1992. We cannot mark items as'gift. We are required to put the actual value of the items won on each package. We are professional, full-time dealers in business for many years, and we treat your lots with care and consideration in a timely manner. The item "Barbary Tunis Nile Mercator Sanson 1734 Antique Map 30240" is in sale since Thursday, April 19, 2018. This item is in the category "Antiques\Maps, Atlases & Globes\Africa Maps". The seller is "germanpostalhistory" and is located in Colorado. This item can be shipped worldwide.